Why I trust my DOGS! Discussion in 'Livestock Guardians' started by Southern by choice, Apr 12, 2019. I snapped this from my cell from the computer monitor. I was watching Tiffany pass yet another afterbirth (3 this time). Notice "D" in the bottom right hand corner. There is one dropped already, she is passing another and he never bothers with her or the dropped placenta. This is what we taught our dogs to do. Out on the land in the field is one thing but in our environment we want to know it has been passed. I share this because these dogs are amazing and I tire of all the BS I see said about the LGD. My dogs are my partners and trust is our bond. Wehner Homestead, SA Farm, B&B Happy goats and 8 others like this. 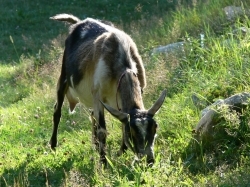 B&B Happy goats, AmberLops, Devonviolet and 1 other person like this. D is a great dog. It takes time and training to make a good dog a great dog. While you sing your dogs praises, I’ll give you the pat on the back that you so richly deserve. Livestock isn’t the only thing we trust our dogs with. LOL Carson is eating, Trip is reveling in the adulation of a 2 year old, ignoring his food. Love these dogs! Wehner Homestead, SA Farm, B&B Happy goats and 7 others like this. Read everything in the LGD forum. Study. Ask questions. These are not your typical fetch a stick, tail wagging, anything you want, dogs. Sometimes I thing they should have their own species name. My experience so far is limited to the first one we have, Paris, a free throw away, messed up psycho Great Pyrenees that took two years to turn her around. Paris is 9-ish, maybe 10 now and slowing down, but still fiercely devoted to her flock. Trip, our 2nd GP, we got as a puppy. Let me tell you, it is a whole lot easier to get a puppy than it is to get a psycho dog that somebody else messed up. I read the posts here, haunting them like a stalker, and LEARNED how to train my dogs. The information here is some of the best reading you will ever have available to you, and it is FREE. I am certainly no expert, but what I've learned here makes me look smart. Ha ha ha! Well it definitely sounds like you know what you're doing when it comes to LGDs! I know they're not like house dogs...I work at a vet clinic and some of the LGDs that have come in are extremely different. You can tell just by looking at them that they're amazing creatures! I knew someone who had a GP as a 'pet' and they had him since he was 8 weeks old...he was the most aggressive and unpredictable dog I've ever seen. I explained to them that it's because being a pet isn't his purpose...but they thought that because he was raised since a pup to be a pet that he should be a great house dog....I felt bad for the dog. If I know what I’m doing, it’s because of all the great people on this site who share their experiences and wisdom.